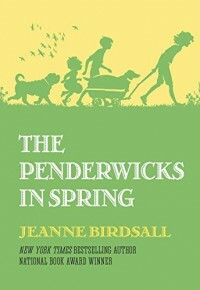 The Penderwicks in Spring by Jeanne Birdsall - marks books. Books are better than movies somewhat but movies are more action packed, and that is why i can not decide which is better. The Penderwicks in Spring by Jeanne Birdsall is a good book to read. Batty is the second youngest girl now with the trouble maker Lydia, and Ben is the only boy. Skye is the youngest of the original Penderwick sisters, and Jane and Rosalind were the other two. Batty was planning the best possible birthday party for Skye, and Jeffrey, her soon-to-be music mentor, is coming over. Nick Geiger is also coming home from war, and will be joining the party. But Batty has other problems on her mind. Skye does not want Jeffrey to come over, because Jeffrey loves her but Skye does not. He constantly bugs her to hang out, but she won't. Tommy also broke up with Rosalind, so it is not looking good for the Penderwicks. But Batty does have a dog walking job and finds a dog called Cilantro. Batty has to resolve these problem so that her older sister does not have a bad party. I recommend this book to people who like ordinary lives turn inside out, and want to know the secret truth about Batty Penderwick. This is a reasonable book for teens and the elderly too.